Here's the concept for 'House Guards', the poorest of the hired swords. They are primarily used by middle class merchants or poor nobles. They are poorly trained and are often only one step above a hired thug. i get no image, just "user posted image"
Kay, you fixed it, looks great! Edited by god_is_my_goldfish, 12 December 2004 - 05:36 PM. LOL That is an awesome description. Love the patch on his leg. Poor sod, I don't envy him in the slightest. Heh, looking at that scruffy fellow just made an idea pop into mind. Would require AI, sound, anims... but perhaps occasionally, the hired help can be seen... pinching something themselves. THat's excellent, not copying thief in the slightest either. Its put me in the mood to model.....just like that hammer priest picture did. How about a text description of what his various attire is made of. Just one thing - no head gear? Nope. These guys are the most poorly armed and armoured of the guards. They are also the least challenging, in terms of their sensitivity to noise, HP, etc. Anyone with serious wealth hires professional guards...these guys are used to fill in the ranks when the cash runs low. 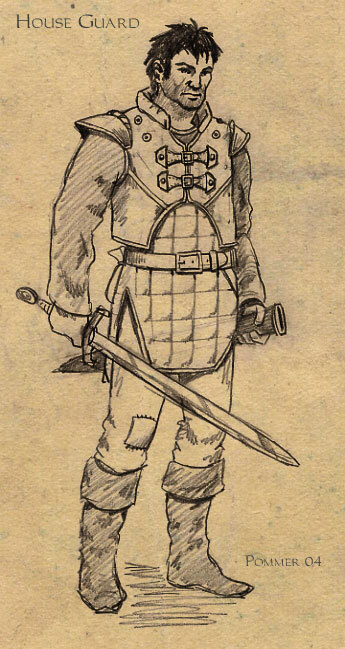 In terms of materials, they wear a stiff leather vest over top of a quilted tunic. The shoulders are hard leather, and the collar is also leather, though more flexible. There are a few metal studs on the vest, but not many. Their gear is generally well-used, with lots of scuff marks. Nothing that they own looks particularly ornate or expensive. Possibly their shirt can be coloured the same colour as their employer's banner (if they have one). Hey, looks good, SH! Keep up the good work. I agree with oDDity that it looks like he should have some sort of head gear, no matter how cheap or makeshift. I don't care either way, as I see your point -- it's just something that seemed to be missing. That's a cool idea, SneaksieDave, btw. Edited by Darkness_Falls, 13 December 2004 - 01:58 AM. The choice of no headgear is one worth debating I think. I like it. I think it gives some variety that the original games never had. Are there any historic examples of cheap guards with no headgear perchance? If they are too cheap to have armour in general, they wouldn't be able to afford helmets. But even if they are having armour as cheap as leather armour, they could still have leather headgear. Edited by Domarius, 13 December 2004 - 07:12 PM. I tried designs that had leather headgear, but it just looked silly. A headband looked ok, but it made him look more like a fellow thief than a guard. And these guys aren't going around expecting a fight most of the time, unlike professional guards, so it works in story terms. On a side note, did you realize that no guards in T3 had helmets? The best they had were chain coifs. I wonder why they went that route? I'm cool with that. It just kinda has the appearance that he maybe just got done playing a sport (fencing?) and removed his helmut revealing his disheveled and sweaty hair. Regardless, I agree it would be nice to have some helmut-less guards. This is good. Yeah, I went overboard on the messy hair. I just wanted to emphasize the rough-around-the-edges look. just wanted to announce that I'd love to do the textures for the houseguard @ oDDity. Sure, when I'm finisjed it, it's one less job for me) I'm doing the haunt ATM, so I'll finish modeling the guard after that. wouldn't it be better tofinish the guard first ? haunts are not really necessary for mansion, are they ? Edited by BlackThief, 15 January 2005 - 11:58 AM. I'm sure haunts could be fitted in to the mansion somewhere like a secret crypt/basement or something. are you talking about the high-poly or the low poly version ? High poly. It'll take a while longer to get the low poly guy done as well. Also, you have to be aware that tying in the spec and normal maps with the colour map on a character model is a lot more of a challenge than a desk or chair. This one shouldn't be too difficult though since he'ss mostly leather. Do you want to UV it yourself? I'd prefer if you could UV-map it, you've more experience in that field and I'm quite fine with the layout of the builder-UV map.